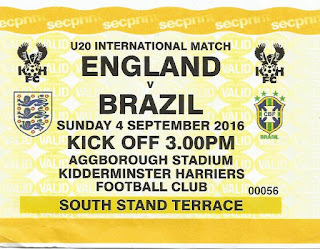 Kidderminster Harriers is a professional football club from the town of the same name who were formed in 1866 from a successful local rugby union and athletics club. The club started out playing matches at Chester Road, which became the town’s cricket club. In 1887 Harriers moved to Aggborough, at the same time a rival club Kidderminster Olympic were formed, with both becoming founder members of the Birmingham & District League in 1889. Both clubs drew regular attendances of 2,000, while derbies over 7,000. The clubs amalgamated after Olympic won the league in 1890, becoming Kidderminster FC and joining the Midland League as a professional outfit. The new club found it tough going. They resigned from the league and were wound up in March 1891. The club reverted to amateur status and joined the Birmingham & District League as Kidderminster Harriers. Several famous names of the time such as Jesse Pennington, Stanley Fazackerley and George Getgood had short spells with the club, before Harriers were crowned as Birmingham & District League champions in the 1937-38 season. Harriers had a brief spell in the Southern League before returning to their roots at the outbreak of war. In 1945 Harriers joined the Birmingham Combination before moving to the Southern League for 1948-49. Future FA Chairman Ted Croker as well as future England international Gerry Hitchens played for Harriers around this time. On the 14th September 1955 Harriers became the first team to host a floodlit FA Cup tie, as they defeated Brierley Hill Alliance in a Preliminary Round replay. The club struggled financially, leading to a return to the more localised Birmingham League in 1960. The league changed its name to the West Midlands (Regional) League in 1963, which also saw the debut of Peter Wassall for the club. He would go to score 448 goals in 621 in appearances in a Harriers shirt. His stellar performances led to Harriers being crowned as league champions in 1964-65, 1968-69, 1970-71 and 1970-71. The club returned to the Southern League for the 1972-73 campaign in Division One North. Following a league restructuring Kidderminster were placed in the Midland Division of the Southern League in 1979-80. In 1982 Harriers were placed in the Premier Division, before progressing into the Alliance Premier League for 1983-84 when they ended as Southern League runners-up to AP Leamington, who were denied entry to the top tier because of ground facility issues. Leamington suffered further a few months later when their boss Graham Allner moved to Aggborough, to start on a sixteen year association at Harriers. In July 1985 striker Kim Casey was signed from Gloucester City for a £2,500 fee. This would prove to be a very wise piece of business as his partnership with Paul Davies tore many defence apart. 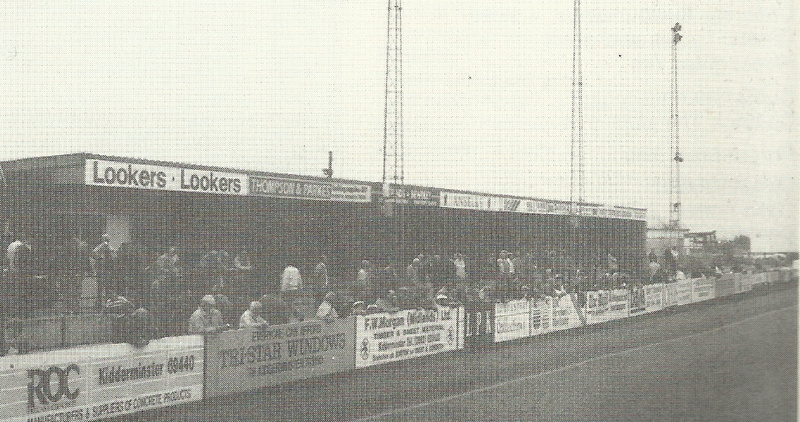 In 1986 Harriers reached the final of the Welsh Cup, where they were defeated in a replay at Aggborough by Wrexham in front of a crowd of 4,304. The following year Harriers lifted the FA Trophy, as Burton Albion were defeated 2-1 at The Hawthorns following a 0-0 draw at Wembley Stadium. In 1989 Kiddy once again reached the Welsh Cup Final, but went down 5-0 at the Vetch Field to Swansea City. In 1991 Harriers were defeated 2-1 at Wembley against Wycombe Wanderers in the FA Trophy Final. The success continued on the pitch as Harriers won the Football Conference, as the Alliance Premier League had been renamed in 1993-94 but they were denied promotion to the Football League because Aggborough was deemed not up to standard. The season also saw a remarkable FA Cup run. Wins over Chesham United, Kettering Town and Woking led to a third round tie away to near neighbours Birmingham City at St Andrews. Harriers defeated City 2-1 to set up a home tie with Preston North End. Once again Kidderminster pulled off a huge shock with a 1-0 win. The reward was a fifth round home tie against West Ham United. The Hammers won the match by a solitary goal in front of the Match of the Day cameras and an Aggborough crowd of 8,000. Another Trophy final defeat followed in 1995. This time a 2-1 defeat to Woking at Wembley would break Aggborough hearts. In 1996-97 Harriers ended as Conference runners-up to Macclesfield Town. Local retired retail millionaire Lionel Newton took over the club for the 1999-00 season and appointed former Liverpool and Denmark star Jan Molby as manager. The move worked as Harriers beat Rushden & Diamonds to the Conference title by nine points to win promotion to the Football League. The move of former player Lee Hughes from West Bromwich Albion to Coventry City netted Harriers £700,000 in sell on fees. However, low attendances and the collapse of the ITV digital deal led to financial problems and relegation back to the Conference in 2005. In their five seasons as a League club, Kidderminster’s best finish had been tenth place in 2001-02. Managers Molby, Shaun Cunnington and Stuart Watkiss all had a go in the League, before Mark Yates arrived during a disappointing first season back in the Conference. In 2007 Yates’ side reached the Trophy final once again. This time they were defeated 3-2 by Stevenage Borough in front of an astonishing crowd of 53,262 at Wembley. In December 2009 Yates departed to take the managers job at Cheltenham Town to be replaced by Steve Burr. His side finished just outside the play-offs in his first two campaigns. An incredible run of twenty two wins in twenty six league games in 2011-12 saw Kidderminster in a battle with Mansfield Town for the title. The Nottinghamshire club came out victorious on the final day of the season. Harriers lost 5-2 on aggregate to Wrexham in the semi-final of the play-offs. Burr was sacked in January 2014 following a rocky period. Former Wimbledon and Newcastle United centre back Andy Thorn was appointed in his place but lasted only fifty four days, despite a giant killing win at Peterborough United in the FA Cup. Star youngster Joe Lolley departed to Huddersfield Town. Burr’s former assistant Gary Whild was Thorn’s replacement. His budget was greatly reduced at Christmas 2014 because of financial concerns. Thirty eight year old Lee Hughes returned to the club but several players departed. After a terrible start to the 2015-16 season Whild was moved upstairs to the post of Head of Football Operations. Tim Flowers declined the invite to take over as Head Coach, leading the appointment of former agent Colin Gordon taking up the hot seat, with Whild departing the club. John Eustace was appointed as team manager in April 2016, but he could not save the side from relegation. Scarborough were playing away to Hereford United in the old Division Four. I was on annual leave from the Post Office, so I was delighted to get a seat with our regular driver Jon .Doomy’ Dyer along with Crusher and my brother Nick. We set off nice and early and decided to visit a few grounds along the way. We’d been inside Eton Park at Burton, Villa Park, Fellows Park and The Hawthorns as well as been turned away at The Molineux. We stopped off in Kidderminster around dusk with the people in the club office on the ground forecourt being friendly with us having a gander inside. Aggborough was quite a basic venue at the time, with the remains of a cycling track around the pitch. Both ends were open shale standing. 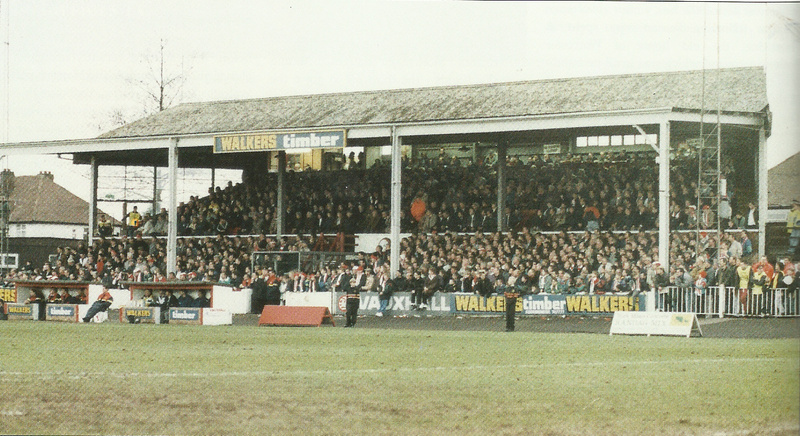 The far side had a cover over a few steps of terracing, while the Main Stand on the near side had seating in two sections, with an extended roof over the original offering cover to the patrons. We headed down to Hereford for pre match beers to see a 1-1 draw in which future top flight star Craig Short came on as a Boro substitute for his Football League debut. Aggborough had been on my radar for some time, having even missed one trip I’d already booked train tickets for. I was not going to miss out on the opportunity a second time, especially for an international charging just £3 admission. The programme cost more at £3.50! I managed to buy a decent value rail ticket from Marylebone to Moor Street, from where I took a train straight across through the West Midlands and into Worcestershire. The streets leading up to the stadium had vendors selling their souvenirs. Lots of families were also grabbing a great offer to watch the stars of tomorrow. My ticket was for the far end, which on normal match days had segregation for the away fans. The barriers were open for the day so I could choose anywhere behind the goal. Aggborough really was a super little stadium, with identical covered terraces behind both goals. 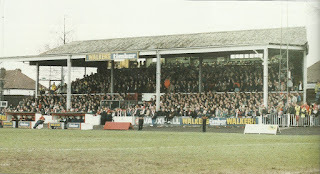 The Main Stand to my left had corporate facilities and a smart roof. The seated stand opposite was neat and tidy. The ground was well looked after everywhere I looked. Of course I couldn’t visit without testing out the legendary catering. The soup was good and thick but didn’t taste how I’d envisaged. However, the cottage pie was extremely filling and top quality. It cost £4.50 but worth the money. Once full and taken my photos I settled into a spot to enjoy the action. Often I complain about modern football; maybe a bit too much so? Players do get too much money, but those at the top have generally achieved. It’s the youth team players demanding this that and the other without even started out in the game that annoy me. I could imagine I was watching a fair few of those on this occasion. For the first twenty minutes the England team were a shambles, full of errors and aimless and misplaced passes. Lucas Pacqeta put Brazil ahead on seven minutes when he nipped in between and slumbering defence and keeper Freddie Woodman to score. 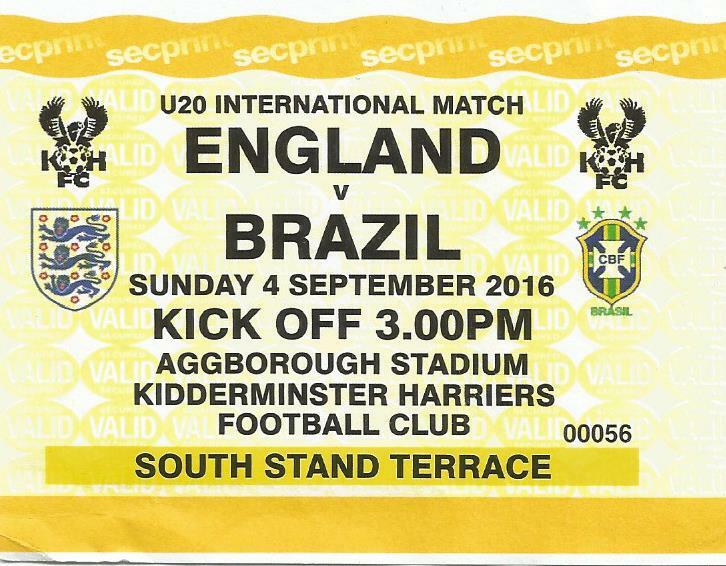 England were awarded a penalty shortly after, but Adam Armstrong saw his penalty saved by Caique in the visitors net. The home side and Woodman in particular were made to pay on twenty six minutes when he dithered while trying to decide where to clear the ball, only for Malcolm to nip in, mug him and roll the ball into an empty net. By this stage I’d made eye contact with an older fella stood close by. It was clear by his expressions that he wasn’t that impressed. He was a really nice chap, with that downbeat Brummie persona who went to Birmingham City and Solihull Moors. We chatted about all things football and lamented just how we should be concerned about the future of the national team if these were the best players that the coaches and scouts could pick out. Arsenal player Ainsley Maitland-Niles was lively enough, if a little greedy at times. He set up Tottenham’s Joshua Onomah who somehow scuffed wide soon after the interval. Caio Monteiro nearly extended the visitors lead, but at least they were being forced back a little as the home team resorted to a pressure game rather than the forlorn hope of trying to outplay the Brazilians. 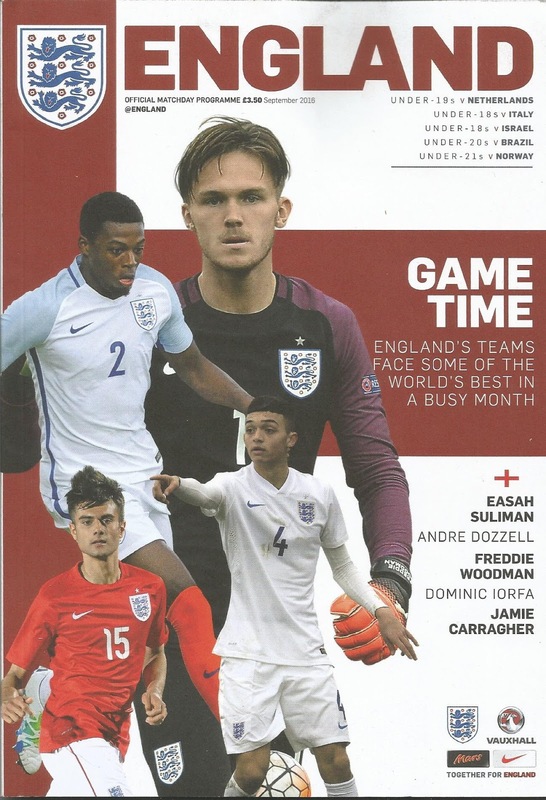 Dominic Calvert-Lewin of Everton and Ademola Lookman who would join him from Charlton later in the season both had efforts well saved by Caique. With a few minutes remaining Calvert-Lewin scored with an excellent header. England piled on the pressure but couldn’t find an equaliser in the closing stages. At full time it had been agreed that both sides would play a penalty shoot out regardless of the result, with the PA man emphasising the point in the hope that the crowd would stay behind. I thought this an excellent idea for young players to practice in a live environment rather than a training ground. My pal and I wandered back to the station. Our main concern about the England side was not so much the forward players, but the standard of the defending. The team contained Reece Oxford of West Ham and Cameron Borthwick-Jackson of Manchester United who had both appeared in the Premier League. Neither installed much confidence in either of us. I alighted at Moor Street once again as I had a couple of hours to kill. Steve Barnes had earmarked a couple of pubs for me to try in Digbeth just south of the city centre. The White Swan was a traditional old corner house with an uninspiring beer selection. The Anchor had the Slovakia v England World Cup Qualifier on the TV. Sadly it looked like they’d sold most of their beer the day before. I found a couple that were OK if not outstanding. The actual pub was a belter. The match was hard work but I celebrated happily with the locals when Adam Lallana finally broke down a host team who were masters of the dark arts. Once back at Marylebone after a nap I headed to the Wetherspoons outlet at Harrow-on-the-Hill for beers with Steve Speller.